Are you all ready for the Holidays? Do you want to be organized for your gift-giving and card making/giving? If your answer is YES, then this class is just for you! I am excited to offer my Holiday Planner Class on October 14 (Thursday) at 5:00 p.m. I will announce the place in the next couple of days. I will try to get a Rec Room so we can have a lot of room to spread out and will let you know ASAP. This Holiday Planner comes with a Monthly Calendar for October, November & December with a To Do List for each month. On the second slot, it has a Gift Check List so you could list people's names and put a check mark after you're done with that person's gift. The third slot has a Christmas Card List with Name and Address for each person on your list and a check mark for "Sent" and "Rec'd". On the Fourth Slot are a couple of envelopes to keep Receipts and Coupons. The fee for the class is $15 and that includes everything you need to make this Holiday Planner. All you need to bring is yourself! I will also provide some drinks and snack for all that will attend. I will be limiting the number of sign ups to 10 people so that I can attend to each person in finishing this project. So, if you are thinking about signing up, do not wait, sign up now to secure your spot! This project is easy to re-create and you can use it as gifts too. 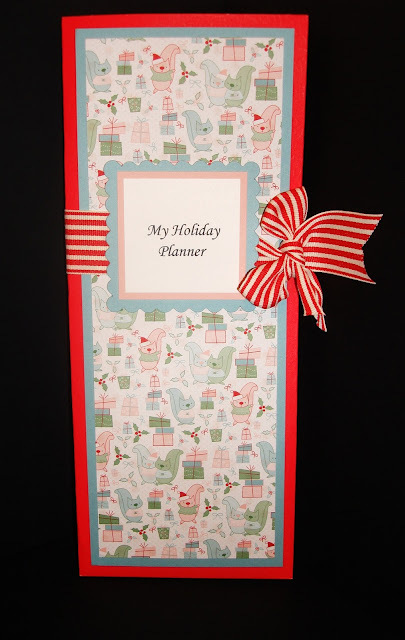 Each student will also receive free Christmas pocket planner pages from http://christmas.organizedhome.com. Their free calendar pages and gift lists will make it easy to stock your Holiday Planner with Christmas planning forms. If you would like to make more than 1 Holiday Planner, I will also offer a Take Home kit for only $12. This price is only good if you signed up for the class. If you would like a Take Home Kit, please let me know at the time you sign up so that I can prepare it for you. Class Fees are expected at the time of sign up. Sign-ups will be open till October 6, 2010 so please make sure to sign up by then. If you are not local to me but would still like to make the Holiday Planner, you can e-mail me at honeyg76@yahoo.com and I can send you the kit by mail for $15 plus $5.95 shipping. I will send you a PDF tutorial and all the print outs you will need to complete the project. To sign up, please send me an e-mail at honeyg76@yahoo.com with your name and phone number for me to call you to arrange for payment of the Class Fees. I love your idea of the holiday planner, I may have to CASE that from you. I am now following you from SC. Love your planner Gilda! Is this the project you were telling me about? I may have to make this one of my stamp camp projects!!! That will give me 2 large and 2 small projects. Woo hoo! Simply WONDERFUL!!! I love it. Thanks for sharing all of your fabulous creations. They are very inspiring. Following you now. I love these! I am going to have to make mine soon!